Our volunteers play an integral part of DVGRR. Whether they’re helping at Meet & Greet events, working with puppy mill survivors in our PHL program or seniors in the Sanctuary, transporting dogs to Golden Gateway or carrying out many of the other tasks that are vital to the success of our program, WE CANNOT THANK THEM ENOUGH! 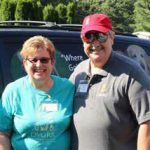 We’re shining the spotlight on Craig and Diane Sagemuehl who participate on volunteer teams for Meet & Greet, dog walking, play times, and Project Home Life (PHL). Diane also helps with Life Skills classes and puppy socialization. Since they began volunteering about six years ago, they’re always willing to help wherever they’re needed, are always enthusiastic, and truly love the dogs. The Sagemuehls describe their history and reasons for volunteering for DVGRR: “We saw a notice for a Meet & Greet and decided to stop in to see the dogs and the facility. We talked to Heather, took a tour, and got information about PHL and volunteering. We were hooked! We were both still working full time and had family responsibilities, so we volunteered one Saturday a month with PHL in its former location in the basement apartment at the caretaker’s house. Since retiring, we’ve been able to get more involved with volunteer activities. “We have both always loved dogs and have always had them as part of our family. After finding out about DVGRR and its mission, we were excited for the opportunity to become involved with this outstanding organization. The best thing about volunteering at DVGRR is spending time with these amazing dogs – for Diane, especially the puppies! We love watching them grow and helping them come out of their shells, so they can find their adoptive homes. Knowing we are helping to make a difference in their lives is so rewarding. Their family consists of two daughters, their husbands, a grandson, two granddaughters, and two “granddogs.” They live with their 22-year-old cockatiel, Arley, and a 15-year-old Golden Retriever/German Shepherd mix, Annibel. In addition to DVGRR, the Sagemuehls also volunteer at the Greater Berks Food Bank and enjoy traveling and spending time with family and friends. Jason and Annamarie DeCarlo are the volunteers we’d like to put in the spotlight. They’ve been volunteering for DVGRR for about 10 years, helping with Project Home Life (PHL), Meet & Greet, Transport Team, and spreading the word about our mission at community events. Annamarie adds, “Volunteering is my ‘therapy.’ I’ve always loved animals and knew I’d spend part of my life working with them. Although life choices took me down a different career path, volunteering is a natural fit. No matter how crazy or challenging life can be, working with PHL dogs grounds me.” Jason agrees and shares that his favorite part is spending time with dogs, giving them as much love as possible. In the 10 years in which they’ve been part of the DVGRR family, they’ve adopted seven dogs. Today the family consists of Jason, Annamarie, Jessie (13), Daisy (14), Trooper (10), and Mickey (16). They first learned about DVGRR in 2007, and at the time had two 2-year-old Goldens, Sassy and Jessie. After Sassy was sadly killed by a car after chasing a rabbit into the street, they – and Jessie – were devastated. A friend told them about DVGRR. There were no puppies available at the time (and they adopted a puppy elsewhere), they were touched by the senior dogs and started volunteering twice monthly, specifically to spend time with the seniors. Since then, they provided hospice for Dusty (Dusty’s Den at the Sanctuary is named in his memory), took in Conrad (whose owner was deployed and had no family to take him), Cierra (relinquished after her family lost their home in a foreclosure), Daisy (who “picked” them and was their first puppy mill survivor), Trooper (their first special needs dog), Harley (a dog that changed their lives), and Mickey (the oldest dog relinquished to DVGRR). Jason is a deputy coroner in Lehigh County and works part-time as an EMT. Annamarie is a business analyst for an insurance company, working from home – perfect for four senior Goldens! Spare time is spent with the dogs, with Sundays reserved for Eagles football or NASCAR. “I have been aware of DVGRR for many years. I was first made aware of the organization around 1988 from a Maryland woman who was also involved in telecommunications and was a member of an association to which I also belonged. I knew way back then that I wanted to volunteer after I retired. When I retired from my telecom position and went to Wenger’s of Myerstown Motorcycle sales, I sponsored an open house and fundraiser for DVGRR. Robin and her husband, Glenn, have two dogs. One is a yellow Lab, named Dakota, and the other is a Greater Swiss Mountain Dog, named Bear-Bear. As a Lab, Dakota loves to eat, and when it’s time to come in the house, they say “kennel,” so she knows she’ll be getting a treat. Otherwise, she lies down and looks at them. Bear-Bear (whose name started as “Bear” but was changed because of one of their nieces always repeated his name) comes as soon as he’s called. He loves attention. Walking and baking are some of Robin’s hobbies, and together with Glenn, they enjoy spending time with their dogs and motorcycle riding. They’d taken a cross-country ride to North Dakota and enjoyed it so much that became their Lab’s name. 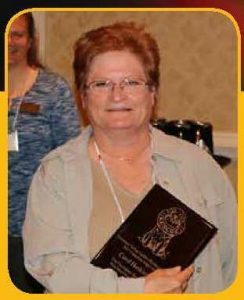 We’re putting the spotlight on one of two of our Guardian Angel award winners, Carol Hoskinson, a long-time supporter and volunteer. 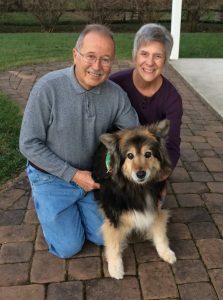 Carol said, “I’d been aware of DVGRR for many years, but in 2012, I learned of the NC20 rescue and followed those dogs closely over the next few months. Then we decided to bring Caroline (one of the rescued dogs) home. After a long year of adjusting to life with her, I became interested in DVGRR’s work with fearful dogs. “Now I volunteer at The Lynne Glennon Sanctuary in Project Home Life, working with fearful and senior dogs. I also volunteer in the Life Skills and Basic Manners training. We work with the dogs in the main kennel helping them adjust to things they will run into in their adoptive homes such as meeting strangers, getting in and out of cars, getting used to strange objects, etc. Plus, I help with setting up events and whatever else is needed when I have additional time. “I love helping the dogs adjust to new people and situations and just offering them some comfort. It’s always a special moment when you see a dog make progress, no matter how small. The first time they give you eye contact is always very special. I also like giving the dogs some structure for them to gain confidence, so I work with the Sanctuary dogs, teaching them some very basic obedience skills. That varies by the individual dog. I would be remiss if I didn’t mention the great people who work and volunteer at DVGRR. They all contribute to DVGRR being a wonderful place to volunteer. I really value the common goals we share, and I especially like the friendships I’ve made here. Thanks, Carol, for all you do! “My life’s passion is the welfare of animals, especially dogs, having been in love with dogs since I was a little girl. I became particularly enamored with Golden Retrievers after getting my first dog, Jessica, in 1994. Over the years, my family has included a total of ten dogs, six of which were rescues, including a special needs puppy, a senior dog, and middle-aged dogs as well. 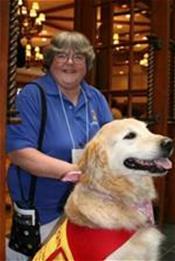 “I’ve volunteered for various rescue groups, and after returning to New Jersey in 2009, I adopted Grady, a 4-year-old Golden from DVGRR. I began volunteering for Meet & Greets, and over the last 18 months, I have had the pleasure of calling all the adopters for post-adoption follow-ups as well as speaking with many prospective adopters in the pre-adoption phase regarding their adoption applications. “Whether it’s the pre-adoption phase when families are so enthusiastic at the prospect of adding a family member or the post-adoption process when the adopters are so happy with their new furry friend, I find it extremely rewarding to be a part of the process of finding dogs their forever homes. Add to that my ability to work with and support the dedicated and wonderful staff at DVGRR and I feel very fortunate in my work every single day. Thanks, Joan, for all you do! We don’t have official crowns, but Frank and Cindy Wiltraut might just be our king and queen of transport. Since we started keeping detailed transport hours in August 2014, they have clocked over 233.5 hours on the road and traveled 9,947 miles to transport the dogs to Golden Gateway. In addition to their transport volunteer duties, Frank and Cindy also volunteer monthly at our Meet & Greet events. “We’ve been DVGRR volunteers for over four years and have thoroughly enjoyed every minute. We were very proud to become a part of this extraordinary organization. Our own Golden Retrievers have had such a positive impact on our lives that we wanted to take the opportunity to give back to this amazing breed. “We have since met many dedicated individuals at DVGRR who share our passion for the dogs. Most of our volunteering is centered around Meet & Greet events and transporting. It’s very rewarding to know that we are contributing to finding these super dogs forever homes. This certainly is the driving force for us. We can’t thank the Wiltrauts enough for their dedicated service. So many miles have resulted in so many dogs finding their way to Golden Gateway and ultimately, their new homes. Thank you! We’re shining the spotlight on long-time volunteer and adopter, Barbara Bennethum. Barbara first learned of DVGRR after reading about the early days of DVGRR looking for foster homes. She began volunteering at the start of the capital campaign to raise money to purchase Golden Gateway. She adopted her first DVGRR Golden in August 2002, and 15 other DVGRR Goldens followed! Of those, only one was a puppy that was 3 months old when struck by a car. Her owners couldn’t afford to treat the fractured leg. Dr. Krick repaired the leg so well that Barbara can’t remember which one it was. To this day, that dog, Heidi, runs instead of walks and will be 10 years old soon. Thank you, Barbara, from all the dogs and staff at Golden Gateway! Lorrie has been volunteering with DVGRR for two years, but she is like part of the family. She pops in weekly to see if we need anything done that she could help with. Amy keeps her plenty busy asking her to do local transports for us as well as the Philadelphia airport runs. On days we don’t need Lorrie for transport, you may find her in Pap’s Place helping ship items, sweeping, cleaning, pulling weeds, or even organizing one of the sheds! At events, Lorrie is always one of the first to arrive to help set up and do whatever is needed that day. 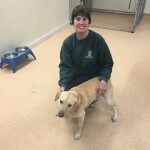 Lorrie has a true volunteer heart – she is here for the dogs and expects nothing in return, and is always humbled when we thank her for helping. Lee Becker has done an amazing job organizing transportation volunteers for the past seven years. ManyDVGRR dogs are now safely in loving homes, or cozy and safe at Golden Gateway, thanks to Lee’s time and energy. 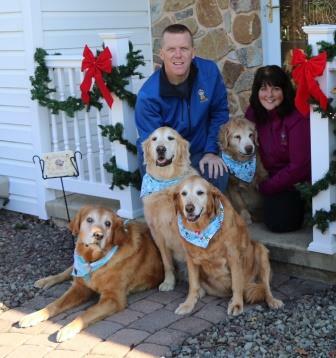 We are incredibly grateful for his dedication to our dogs and congratulate him and his wife, Kay, on their recent adoption of Brogan (#14-001). Lee has orchestrated transports from as far away as Florida, New York, and Illinois. When dealing with an injury last year, he and Kay continued to help us get dogs into the program. As much as he loved every transport success, one dog never made it out of his car – a young male from Florida with extreme thunderstorm anxiety. Rusty and Lee bonded during the trip, and Lee made every transport assignment in honor of his Rusty (06-174). From all of us in DVGRR, human and canine, our heartfelt gratitude goes out to Lee and Kay. Barry Rupp is a dedicated dog walker and makes those rounds every Tuesday and Friday. Plus he serves on the Transport, Meet & Greet, and Project Home Life Teams. Most recently, Barry has made a big difference at Golden Gateway with his non-dog skills. As you may be aware, there are a lot of physical changes happening on our grounds, and Barry has served an integral role. First, he provided a complete buildings and grounds layout of the DVGRR campus. 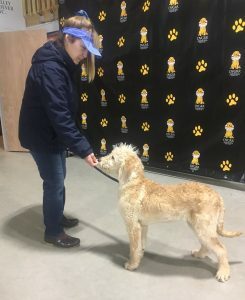 He’s been our special projects manager, providing detailed drawings of the modifications to BARK to accommodate the digital x-ray unit as well as complete fencing and shed requirements for The Lynne Glennon Sanctuary for Senior Goldens and Puppy Mill Survivors. He’s worked with the contractor and septic repair company to pinpoint and correct issues with our septic tank system and is currently serving as the contact point for the interior remodel of the Sanctuary. Thanks, Barry! We certainly appreciate your time, dedication and expertise. “I learned about DVGRR through an article in the Philadelphia Inquirer about famous Philadelphians and their dogs in 2000. Ed Rendell was one of the people included, and he and his wife had adopted Mandy (#96-106) from DVGRR. “I began volunteering shortly after DVGRR created Pap’s Place and BLTs as a result of a mailing recruiting adopters to become volunteers. My husband and I have adopted four dogs from DVGRR: Cody #18 (00-064, RB 2008); Buddy #33 (07-061, RB 2011); Murphy #13 (11-035) and Erin #1 (11-036). “I volunteer in Pap’s helping with retail sales and also serve on the Community Events team. My favorite time is Meet and Greet, especially when a dog is adopted, and they come into Pap’s for a new collar and leash… and maybe a new name tag and toys! The dogs seem to know they are going home. 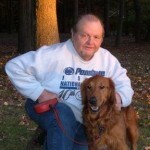 “The highlight of my volunteer work has been taking Pap’s ‘on the road’ to the Golden Retriever Club of America (GRCA) Nationals in 2008 in Warwick, RI, and again in 2011 in Conyers, GA. We met so many wonderful folks at these events. (The next one on the east coast will be in 2014 in North Carolina.) One of the highlights of the Nationals is the Rescue Parade. We had SIX DVGRR dogs in the 2011 parade! In addition to volunteering, Regina is also our go-to seamstress when we have a sewing project. Regina has sewn beds for our transport crates, and her latest project was making the donation vests for the dogs to wear at community events! (Pictured here at Golden Gala.) She even made “themed” shirts that we used as Silent Auction items at our fundraisers! Susan Evasew and Renee Hashinger have served as volunteers for about six years. Their connection goes back to their first adopted Golden, Kamoo (05-094), who passed away in 2005. 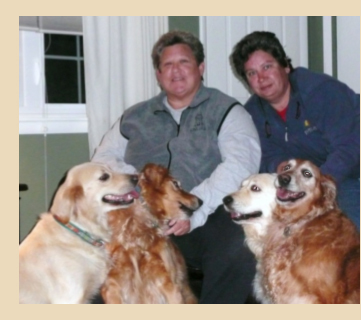 They currently share their home with a trio of females..
Renee and Susan began volunteering after realizing that there was a limit to how many Goldens they could adopt, but they could help many other dogs by volunteering. “We want to try to bring them as much joy as they’ve brought us,” they explain. What is the most important thing that Susan and Renee bring home with them after volunteering at DVGRR? “The satisfaction that the dogs are in a great place, being taken care, and knowing that they’re going to find their forever homes,” Renee explains. “I’m very satisfied that a dog that I handled or helped in some way will find their forever home,” Susan adds. WANT TO GET INVOLVED? Visit our Volunteer page or submit an online Volunteer Application!